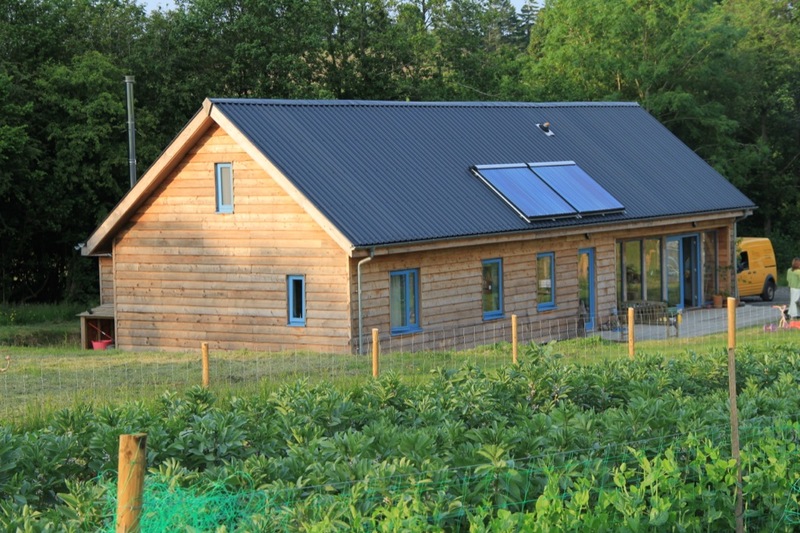 Mick and Alice’s self build is an enlightening story of persistence and hard graft. Both committed organic growers, they purchased a 2 acre field near Knighton, Powys and worked hard to establish a viable market garden, while toughing it out with their 2 young girls in a cold and draughty mobile home. Eventually the fruits (or vegetables?) of their labours paid off and they were granted planning permission to build an affordable dwelling with a section 106 agreement. For more information on section 106 agreements click here. JBD architects of Hereford came up with a contemporary design with single storey open plan living space and Mick and Alice were all set to go with a conventional modern timber frame construction when they happened upon Castle Ring Oak Frame. After an informal discussion with Rob and a look around his home, they decided to see whether they could incorporate a traditional timber frame into their design and at the same time keep within their limited budget. Balancing the design and build costs were key and were achieved by combining a post and beam douglas fir frame with a SIPS building envelope provided by SIPS eco panels. Mick will be the first to admit that while he’s great at growing pumpkins, building is not his specialised subject so it was with fear and trepidation that he embarked on project managing the build, starting with the groundworks. Somehow he managed to survive a desperately cold and wet winter and a building site that resembled a scene from a wet Glastonbury festival, to emerge in the spring ready for the frame raising. Friends and neighbours were called upon to help and finally the great day arrived. Mick’s groundworks were perfect and everything proceeded skywards without a hitch. The sips “overcoat” followed on quickly once the frame was up and provided a dry shell for Mick to oversee the rest of the build which was finished with the help of friends and local subcontractors. The house looks stunning and has blended into its rural surroundings with the help of locally sourced larch weatherboarding and agricultural sheet roofing material. The sips envelope gives it fantastic thermal performance and it’s environmental credentials are further enhanced with a state of the art wood boiler and solar thermal panels.